Armando gets the mustache treatment. Queen frontman Freddie Mercury passed away in 1991 at age 45. Since then, he has been fondly remembered for his music, his memorable stage persona, his legendary style, and--of course--his ever-present mustache. Google is commemorating Mercury's life through a special video doodle, which over the course of 98 seconds shows the singer on stage, dancing with a vacuum cleaner, flying on a tiger, and sitting on a throne--all to the backing of Queen's 1978 hit "Don't Stop Me Now." To further commemorate Freddie, we thought we'd show you how to create a little tribute all your own--with mustaches! The highly amusing Mustachio plug-in for Google Chrome adds a mustache to any online image--with some comical results. 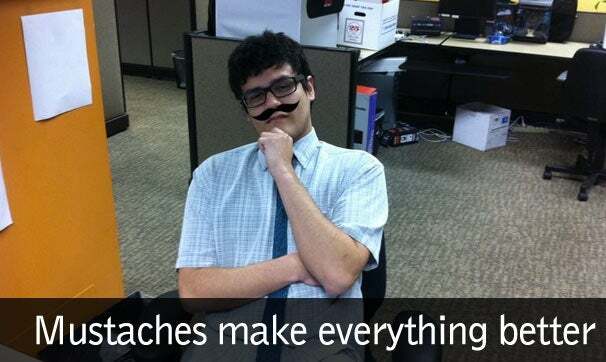 Mustachio works by utilizing a face recognition API from Face.com. The API scans the Web page you currently have open, and when a face is found, one of several styles of mustaches will be added to the image. If you find that Mustachio isn't working for you, believe it or not, an alternative plug-in is available in the form of (wait for it...) Must Stache. Although not created with Mercury specifically in mind, these mustache plug-ins offer one unique way to celebrate the man's life. If you give them a try, let us know in the comments.